Driving on the highway cars travel at the speed of desire… until a police officer is identified and then their driving habits change. Identity informs behavior. When children are playing in a room without an adult they will do so nicely for a time but eventually a conflict will emerge…. until a parent or adult enters the room. Identity informs behavior. The context of this passage is the Sermon on the Mount (SOM). In the SOM, Matthew 5-7, is a long section of teaching from Jesus. Some scholars believe it is multiple teachings combined together, while others believe it is a single unity of teaching. Regardless, it is one of the most primary and most profound passage we have of Jesus’ teaching on what it means to be one of His disciples. Then, Jesus proclaims a powerful statement for the people who have been transformed by the power of His teaching. Jesus’ disciples have a new two-fold identity: salt & light. “You are”: not you have, you must, or you will become, but are. This is not a command but a statement of being. “You are salt… you are light”: Each of these identities are valuable. Roman soldiers were often paid in salt, and it was from that practice that the expression “not worth his salt” originated. “Salting the earth” was an ancient custom of victorious armies sowing salt upon the defeated cities as a form of cultural purification (cf. Judges 9:45). Ancient societies valued light of the sun so much that they worshiped it. Society developed myths, religion, and science based upon astrology. Without light, very little work was done… only evil deeds hidden. In contrast: Jesus is saying that the earth is unsalted (decaying) and unlighted (dark). Jesus spoke to the disciples identity as a group; you is in the plural. Their identity was both personal and communal to show an interdependence. The reference to “a city on a hill” involves a group of people that God has called unto Himself. The purpose for the people of God is to do good for others (plural) to glorify God. So identity is not about what you do but what Jesus has declared you to be; being precedes doing. Every other religion teaches that one must do something to be accepted. Christianity teaches that you must be something – in Christ. In Christianity, we can never do anything to be accepted by God other than acknowledge our need for grace as a sinner and receive the atonement for our sin in the life, death, and resurrection of Jesus Christ. Jesus gives us an identity that influences and illuminates our environment. The identity of salt and light are descriptions of ways His followers influence the surrounding environment. Identity is never given just to be invisible, it always influences and illuminates our environment. Likewise, the church exists not for institution-sake but for influence (salt) & illumination (light). Salt has an immediate influence; just a little is noticeable. Salt functioned as a preservative on meat from decay and death. it stings before it heals… Christians are called to be salt not sugar or sweetness. Salt must be used to be effective. light is an immediate illumination; just a little is noticeable. my sleeping prefers darkness but nightlights, monitor lights, pc, tv, clocks, etc. When used, salt has an immediate influence and light an immediate illumination upon their environment. However, there are moments that these can go unused or perhaps lose their impact. The internal reality for salt and light is to have impact. 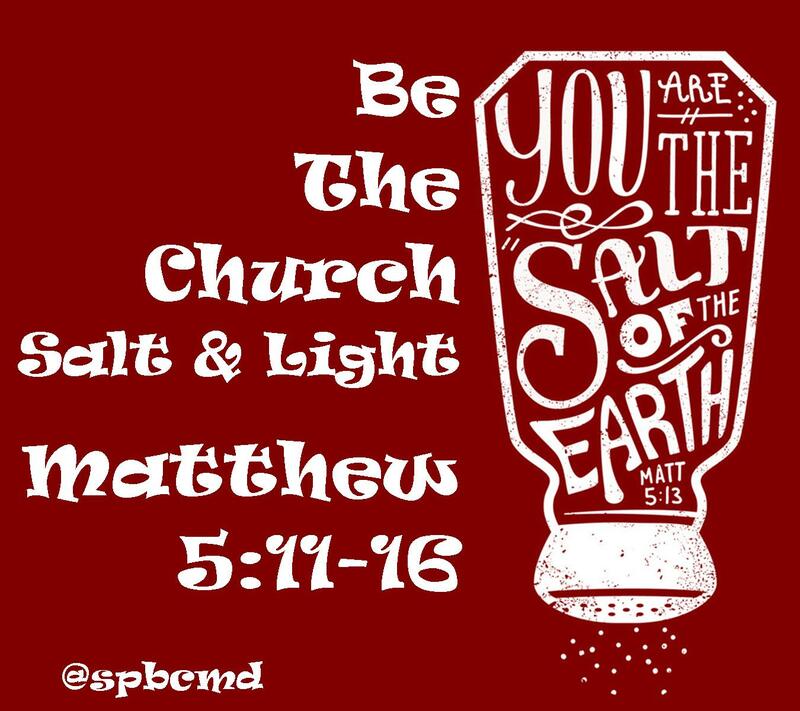 A Christian’s impact as salt and light is often found through living out the beatitudes (Matthew 5:1-9). Again, the beatitudes are counter-cultural characteristics for a disciple of Jesus to live. There are external factors that may cause a Christian’s impact to be lessened – saltless and darkness. A Christian loses its saltiness when it becomes influenced by the world and its values. A person will either be an influencer of the world or become influenced by the world; if we don’t change the world then we will be changed by it! Likewise, a Christian hides its light when they are ashamed and afraid. A person will either be courageous in faith or covered up in fear. Not when they hear great sermons… when they hear great choirs… but when they see your good works! Sermons without application will result in expiration. Do our actions lead others to see & glorify God? The Christian’s goal in culture should be that though they may not believe as we do they may say of us: “Those Christians are the ones who run in when everyone else is running out. Those Christians are the ones who didn’t give up on the crumbling inner cities. Those Christians are the ones who brought peace to [war-torn nations]. Those Christians are the ones who put an end to human trafficking. Those Christians are the ones who helped win the war on AIDS around the world… Those Christians are the ones who [ministered to families dealing with alzheimers, mental disabilities and illnesses…] Those Christians are kind and make me want to believe in God.” (Margaret Feinberg, Quoted in David Kinnaman and Gabe Lyons, UNChristian, 234). à Do you believe you can make an impact for Jesus Christ as just 1 person? à Do you believe our small church can make an impact for Jesus Christ? It doesn’t take much salt or light to have an impact. A small group of people – or even one person can have significant influence. Albert McMakin was a 24 year old farmer who had recently come to faith in Christ. He was so full of enthusiasm and eagerness to share with others that he filled a truck with people and took them to a meeting to hear about Jesus. There was a young man whom he was especially keen to get to a meeting and hear the gospel, but this young man was hard to persuade. The young farmer’s son was not only busy at home but also in his social life – apparently he was frequently falling in and out of love with different girls and did not seem one bit to be attracted to Christianity. Eventually Albert McMakin managed to persuade his friend to come by simply asking him to just drive the truck for others to attend. When they arrived, Albert’s guest did decide to enter the meeting and was mesmerized by the great message of truth, hope and love through Jesus Christ. The young man went back again and again until one night he went forward to personally give his life to Jesus Christ as his Savior and Lord. That year was 1934, and since then this unassumed believer has spoken to multiple millions of people, been the confidante of 9 United States Presidents, led thousands to faith in Jesus Christ. Who would have thought? We cannot all be like Billy Graham but we can all be like Albert McMakin. Albert’s compassion to see people as Jesus saw them, to live as salt and light was the planting of a seed for Jesus to grow and bear much fruit. Christians today are simply called to be salt and light right where they live.